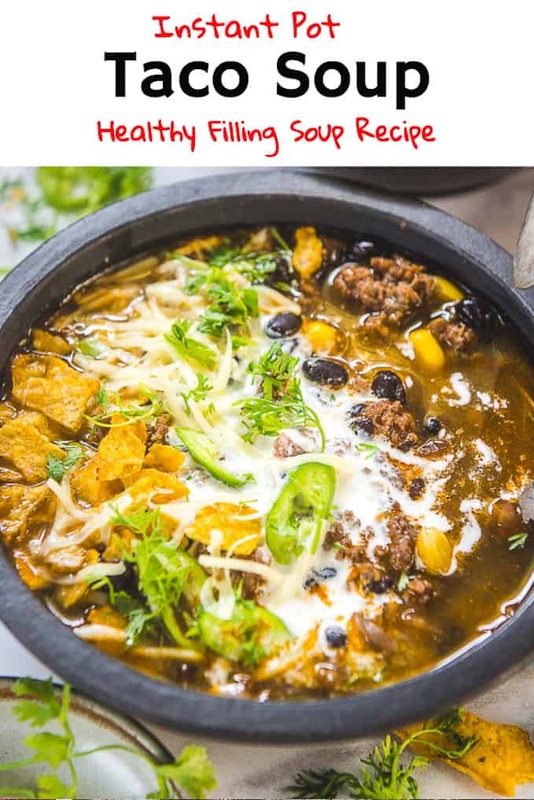 Ridiculously easy to make, Instant Pot Taco Soup is a healthy filling soup which tastes scrumptious as well. Moreover, it gets ready within 30 minutes of cook time. So, make it whenever you want as it is one of the easiest instant pot recipes and serve it with a fresh dollop of sour cream. 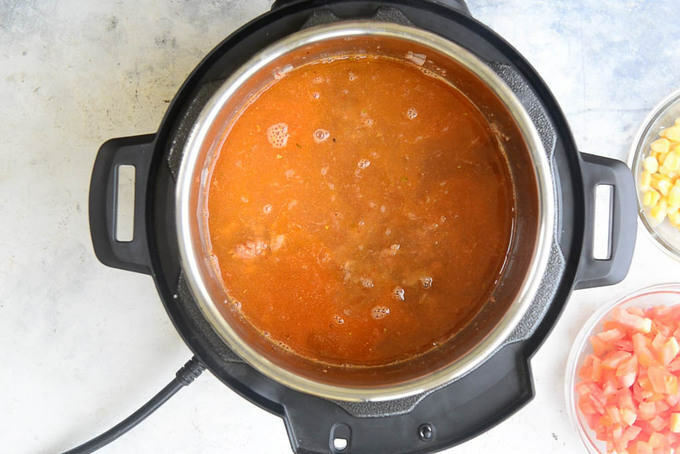 Here’s how to make Taco Soup in Instant Pot. The rain has arrived in India and the climate these days is just perfect to sip some fresh Masala Tea | Indian Ginger Tea but I crave for piping hot soups like anything during monsoon. And with Instant Pot by my side making them has become incredibly quick. 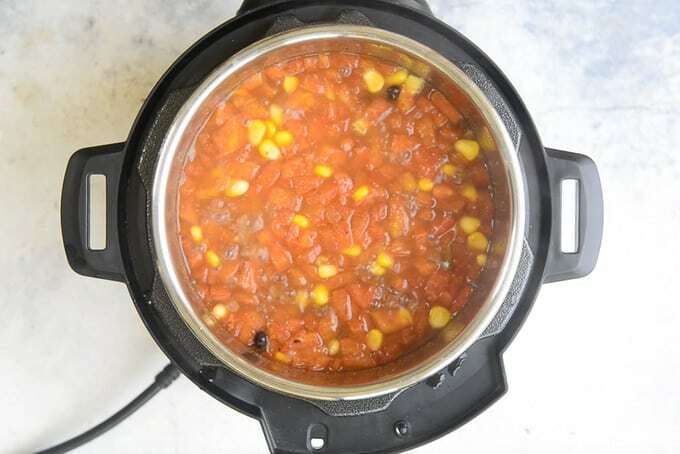 Having made Sweet Potato, Brown Rice, Chicken Breast, Oat Meal, Mashed Potatoes in Instant Pot, I know that even Instant Pot Taco Soup would turn out great without a doubt. A motley of diced tomatoes, beef and onions, black beans, chicken broth is salubrious and sumptuous. You just need a lil amount of olive oil to make it. As a result, even your work out doesn’t go for a toss if you eat it all up. With beans being a hit combo with tacos, you may serve this Mexican soup with tortilla chips or even with cheese, jalapenos et al. 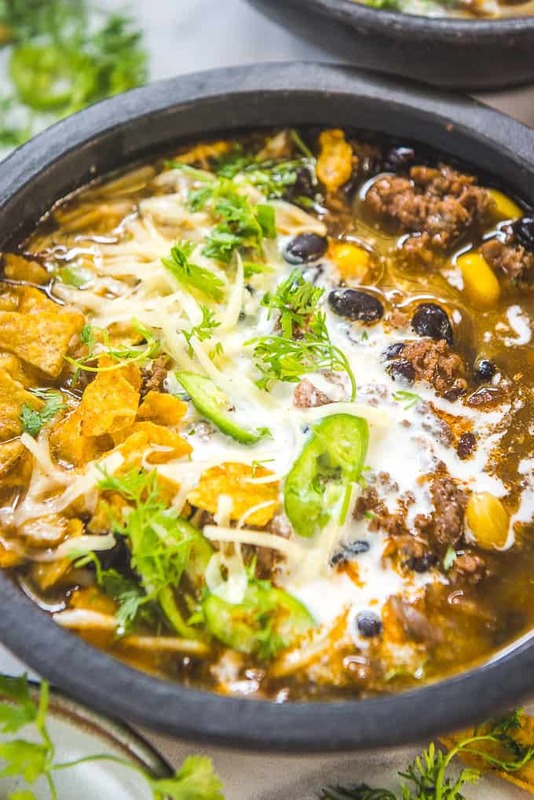 Why should you make this Taco Soup in an Instant Pot? Yes, we can definitely make this soup in a slow cooker or over a stove top and I have nothing against the Indian style pressure cooker but Instant Pot allows multi-tasking especially when you expect guests or during parties. Also, if you do not like standing near the stove constantly while making dishes, trust Instant Pot saves you big time. In Instant Pot you can thaw all the ingredients, select your mode of cooking and manage other tasks then. Therefore, Instant Pot Taco Soup is a good way to try a different way of making soups and quick meals. 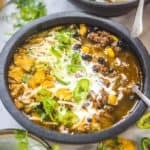 Which toppings to add on Instant Pot Taco Soup? With that sorted, do make this decadent soup super soon and drop your feedback for its recipe through your comments, okay? Press the SAUTE mode of instant pot and add olive oil in the pot. Add ground beef and onion and saute for 3-4 minutes. 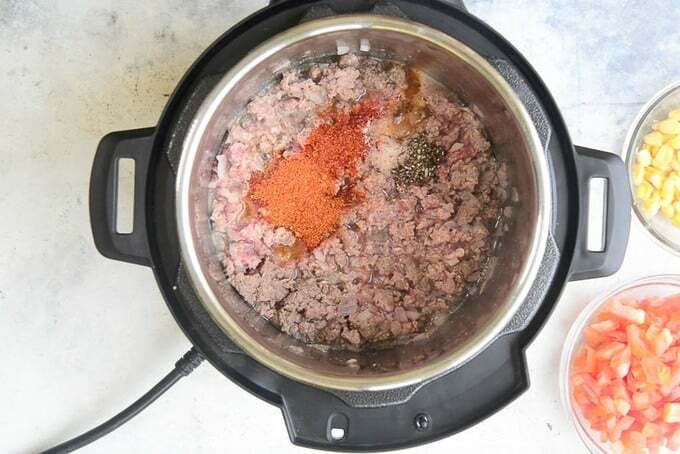 Add taco seasoning, chilli powder, salt and pepper and cook for another 3-4 minutes. 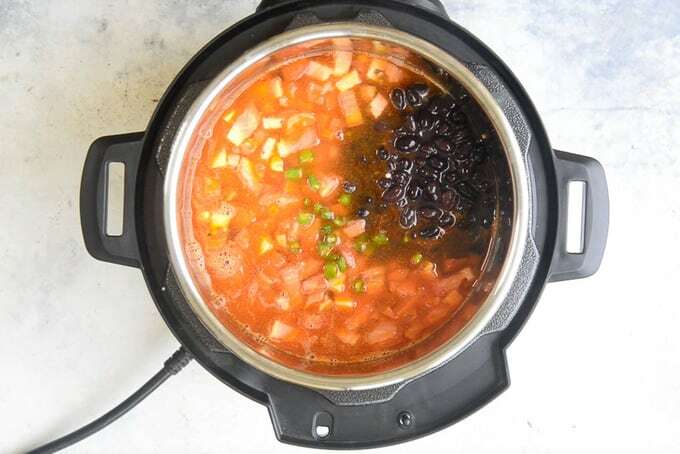 Now add chicken broth, corn, tomatoes, green chilli and black beans in the pot and put the lid of the Instant pot. Press PRESSURE COOK and set the timer to 10 minutes. 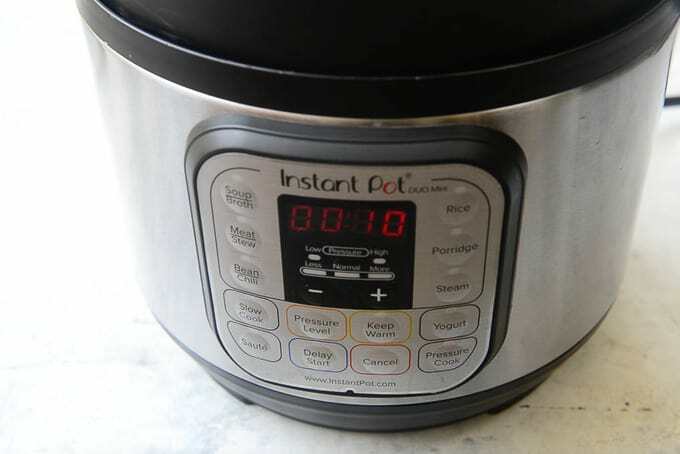 Instant pot will take 10-12 minutes for the steam to build up and start the timer. Once the timer goes off, let the pot sit undisturbed for 10-12 minutes and then do a quick release of steam. 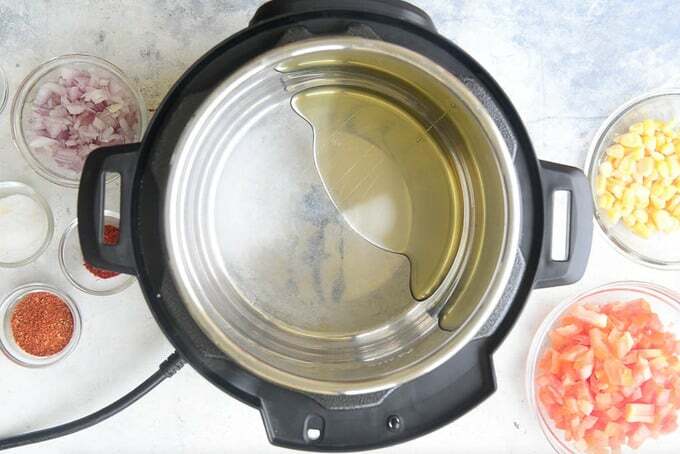 Open the lid of the Instant Pot and give the soup a mix. 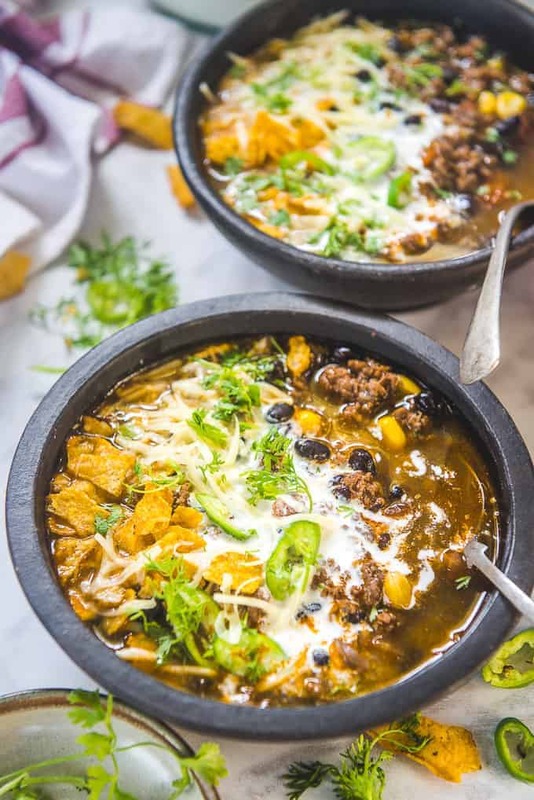 Ridiculously easy to make, Instant Pot Taco Soup is a healthy appetite opener which tastes scrumptious as well. It gets ready within 30 minutes of cook time. Instant pot will take 10-12 minutes for the steam to build up and start the timer. Once the timer goes off, let the pot sit undisturbed for 10-12 minutes and then do a quick release of steam. 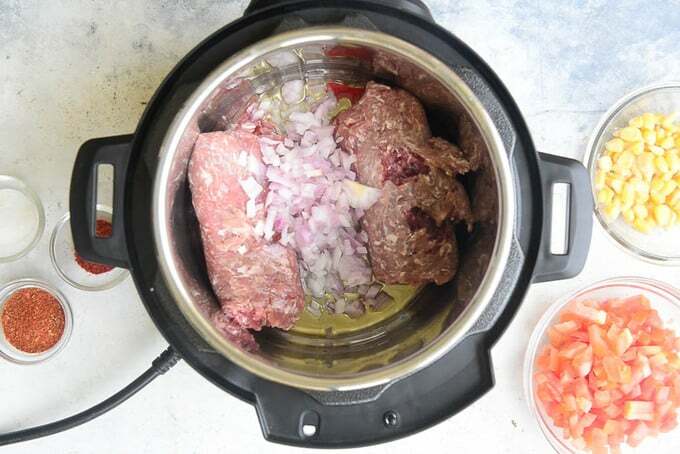 Open the lid of the Instant Pot and give the soup a mix. Transfer the soup in serving bowls. Top with the topping ingredients.